The 2011 Glacier Silver Uncirculated Coin will be the second 2011-dated strike in the America the Beautiful Five Ounce Silver Uncirculated Coin series. 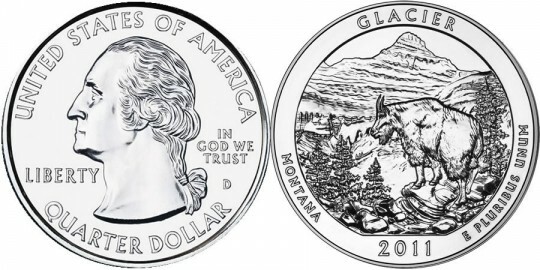 It honors Glacier National Park of Montana with a design showcased on its reverse. Similar to the America the Beautiful Bullion Coins, this series of strikes honors sites of national interest from around the United States and its territories. The designs on both series of coins are taken from a third US Mint series - the America the Beautiful Quarters® Program. However, these silver strikes, along with the corresponding bullion coins, are struck from five ounces of .999 fine silver to a diameter of three inches. Glacier National Park was originally established as a national forest preserve at the behest of the Great Northern Railway who saw the scenic area as an ideal vacation destination for its customers. The railroad continued to push for further protections which was achieved when Glacier became a national park on May 11, 1910. A portrait of the first President of the United States, George Washington, is featured on the obverse of all of the America the Beautiful coins and was originally designed by John Flanagan. It is surrounded by the inscriptions of UNITED STATES OF AMERICA, LIBERTY, IN GOD WE TRUST and QUARTER DOLLAR. The reverse of the strike features a design emblematic of Glacier by showing a mountain goat climbing the rugged terrain of the region with Mount Reynolds off in the distance. It is surrounded by the inscriptions of GLACIER, MONTANA, 2011 and E PLURIBUS UNUM and was designed by AIP Associate Designer Barbara Fox and sculpted by United States Mint Sculptor-Engraver Charles Vickers.